Halloween has come and gone and Thanksgiving is right around the corner. I haven't carved a pumpkin in years but I am good for carving some cake. Fondant: Plenty of orange, some brown, a little bit of yellow. 1. 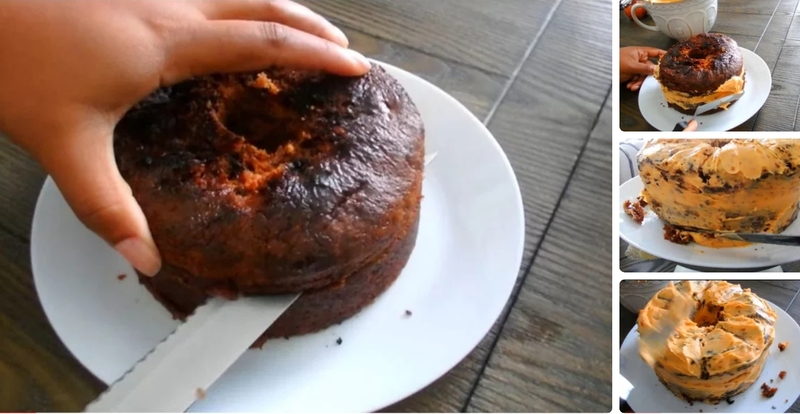 Start off by dividing the cake into two layers. You can make two which will then create 4 layers for a taller pumpkin Then fill the layers with your preferred buttercream. 2. Begin carving small notches off of the top of the cake that are a couple of inches apart. Then carve the bottom of the cake going inward to create a curve as seen in picture 3. From here you can carve more notches into your cake as seen fit, then coat in a thin layer of frosting.Refrigerate for 30 minutes. Optional: Carve a whole into the middle of the cake and coat with frosting. 3. To create plenty of curvature without removing too much cake, build the frosting onto the sides of the cake Then slowly and patiently with a slanted spatula create curves and creases. 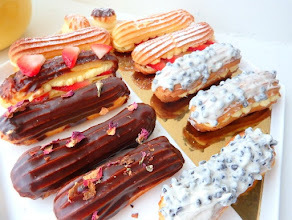 If needed refrigerate for 15 minutes at a time to allow the frosting to be more 'carvable' so to speak. 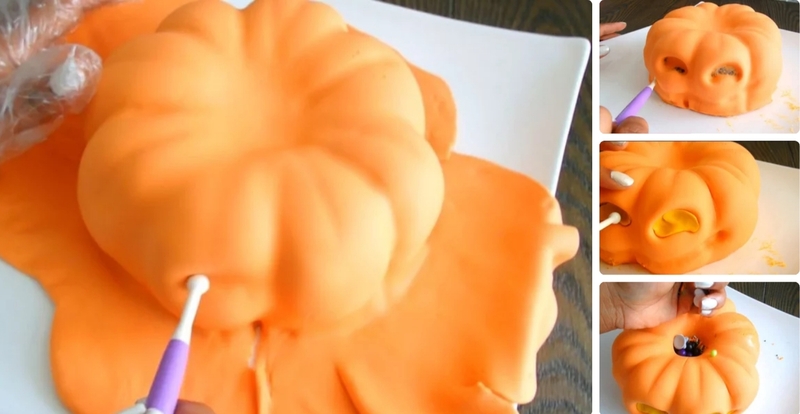 When the cake has completed chilled, carve your jack o lantern face onto one side of the pumpkin. Refrigerate until solid. 4. Roll out a large piece of orange fondant (large enough to cover entire cake). Use your hands to smooth the fondant onto the cake and use fondant tools or similar to push fondant into the grooves of the cake. 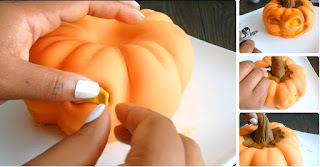 Also use tools or fingers to push the fondant into the face you carved. 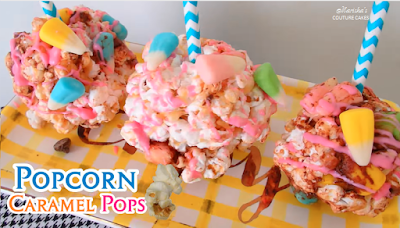 Push the fondant into the top of the cake and fill the hole with candies or sprinkles. 5. Optional: Airbrush the grooves and features of the cake with brown food dye. You can also dust with brown petal dust. 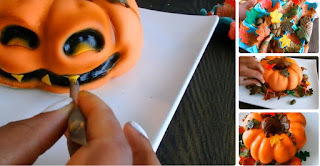 Fill the eyes and mouth with light orange or yellow fondant to create a carved look. Roll a thick log of brown fondant to put on top of the cake. Pull the base of the stem outward and onto the cake. 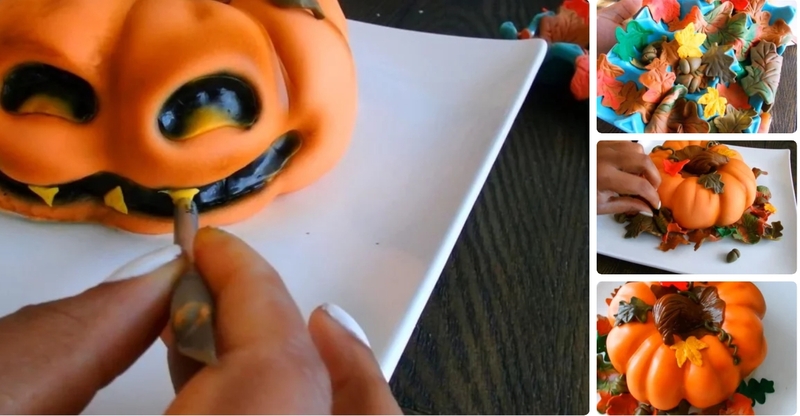 Use a knife or fondant tools to create grain lines in the stem. Twist the stem while pulling outward to create a natural look then remove excess. 6. Airbrush or paint the inside of the mouth and eyes with black food color (leaving out a small portion of the eyes, see picture 1). When the leaves have dried surround the blank side of the pumpkin with fondant leaves and place a couple on top.